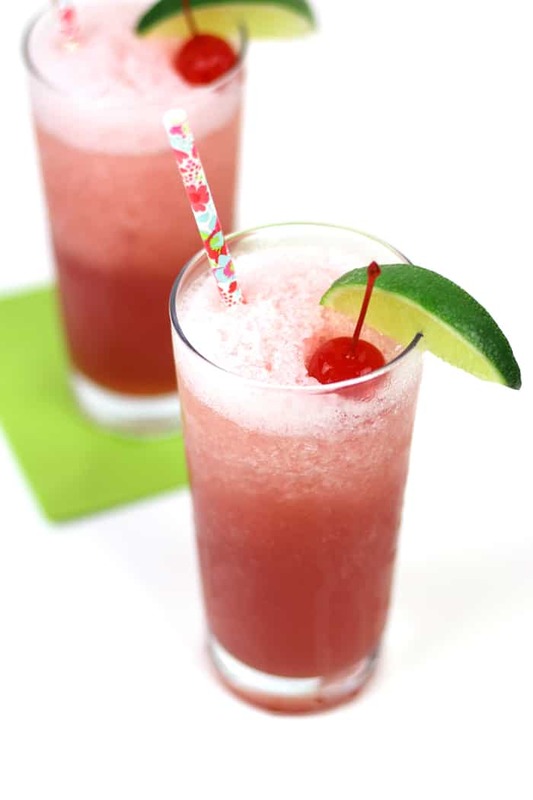 Cool down after a long day’s work with Cherry Limeade Rum Slushies! 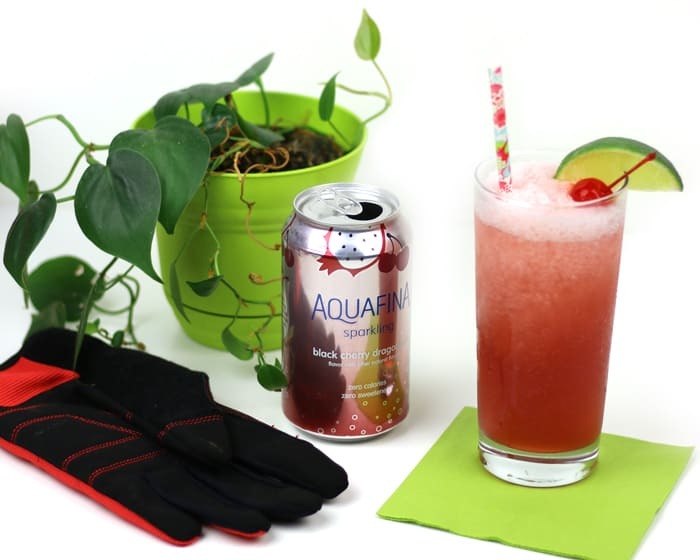 Blend together tart cherry juice, fresh lime juice, rum, ice and Aquafina Sparkling for a frozen libation sure to help you celebrate a job well done. 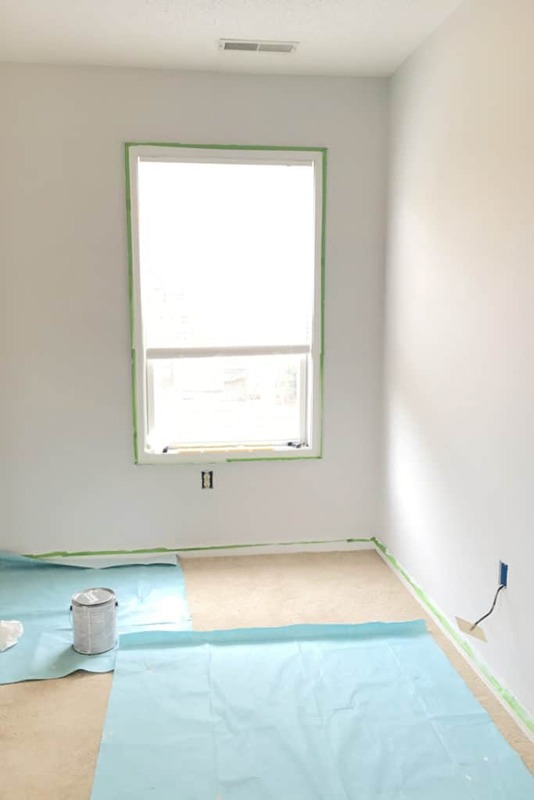 Whether it’s painting rooms, installing microwaves, gardening, cleaning or decorating, home maintenance is absolutely EXHAUSTING. Ever since we moved in, Chris and I have been spending our weekends doing all the house things. Does it ever stop?! Most nights after dinner, Chris and I take turns fixing cocktails for each other while we watch TV or play video games — usually a simple whiskey ginger. But our weekend drinks are usually a bit more exciting because we have more time and energy to prepare them, even though we spend the day working on our new home together. Clearly, we’re on a slushie kick. 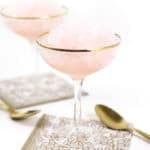 Very often, these cocktails include sparkling water to add a little extra fizz to our drinks. Sparkling water is pretty much my best friend these days. If I’m not fixing another cup of coffee, you’ll always find me with a can of sparkling water in hand during the workday. I love that Aquafina Sparkling has 0 calories, 0 sugar, and 0 artificial flavors. And I love trying out all the flavors! 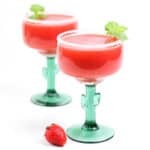 (And making my own — remember these mocktails?) Sparkling water is just so versatile! 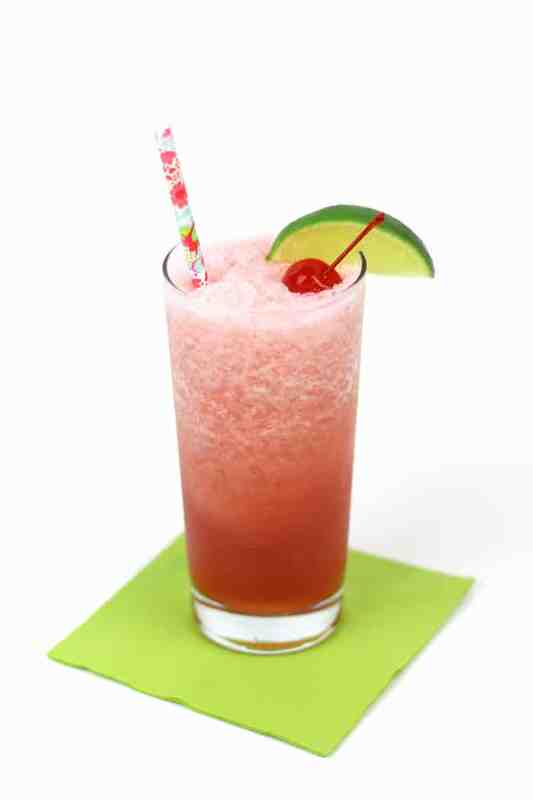 Now that it’s getting warmer where we live, I’ve been dreaming of Cherry Limeade Rum Slushies. 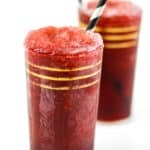 Frozen and flavorful, this slushie cocktail was inspired by the cherry limeade I could get at a local drive-in diner in college. I’ve been telling Chris about it for ages and it’s high time I turned it into a cocktail we could enjoy at home. 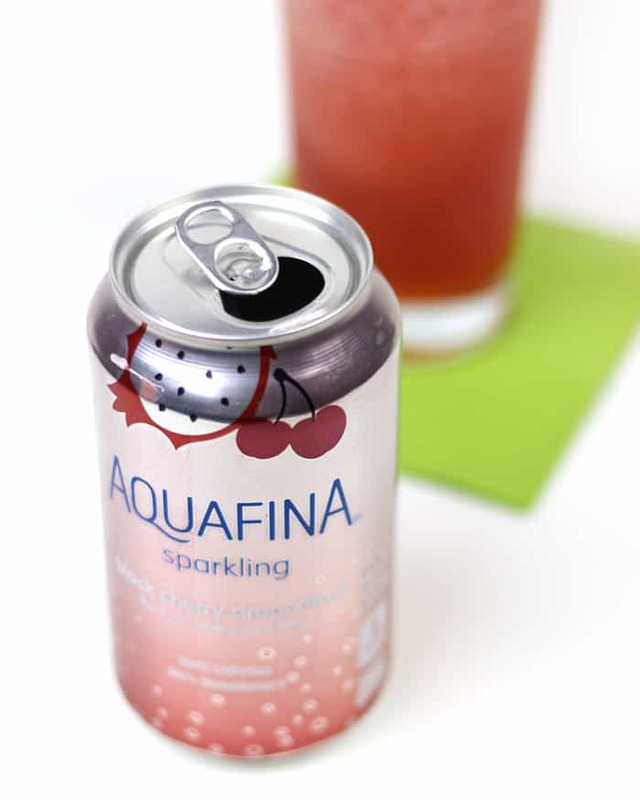 Samplings of Aquafina Sparkling will be held in certain Target locations across the U.S. Check it out next time you’re shopping at your local Target, along with this Cartwheel offer for 25% any Aquafina Sparkling 8-pack flavor, until June 17, 2017. You can also pick up an 8-pack of any of their delicious flavors: Black Cherry Dragonfruit, Mango Pineapple, Lemon Lime and Orange Grapefruit. 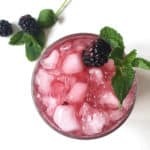 Fizzy and sweet, I just knew we would love this refreshing drink after a long, hot day of rewarding housework! And boy, did we. There is just nothing like a cold drink after rearranging guest room furniture, I tell you. To make it, I combined lime juice, sugar, tart cherries, rum and lots and lots of ice in a blender. I topped each drink with Aquafina’s Sparkling Black Cherry Dragonfruit, a maraschino cherry and a lime wedge. 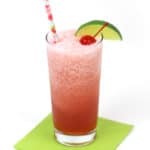 If you’ve got some housework or yard work in your future, please let me recommend this Cherry Limeade Rum Slushies! Follow along with Aquafina Sparkling on Facebook, Twitter and YouTube. 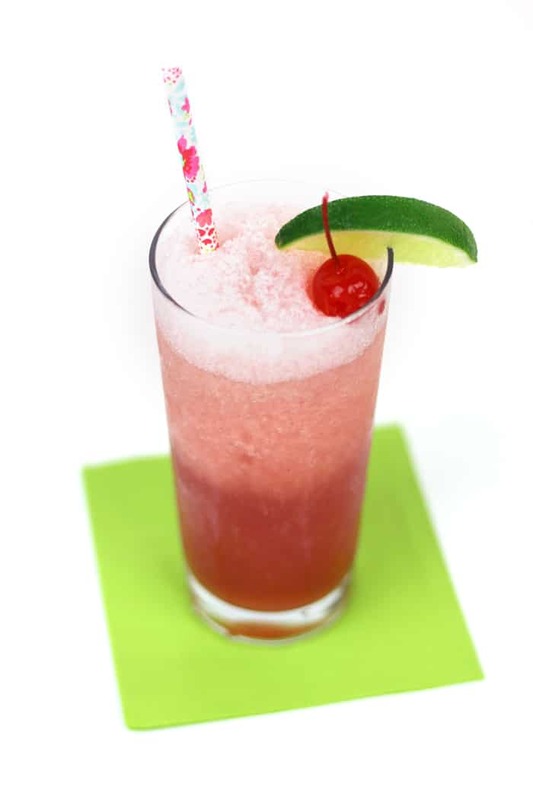 Pin these Cherry Limeade Rum Slushies! In a bowl, combine tart cherry juice, lime juice and sugar. Stir until sugar has dissolved. 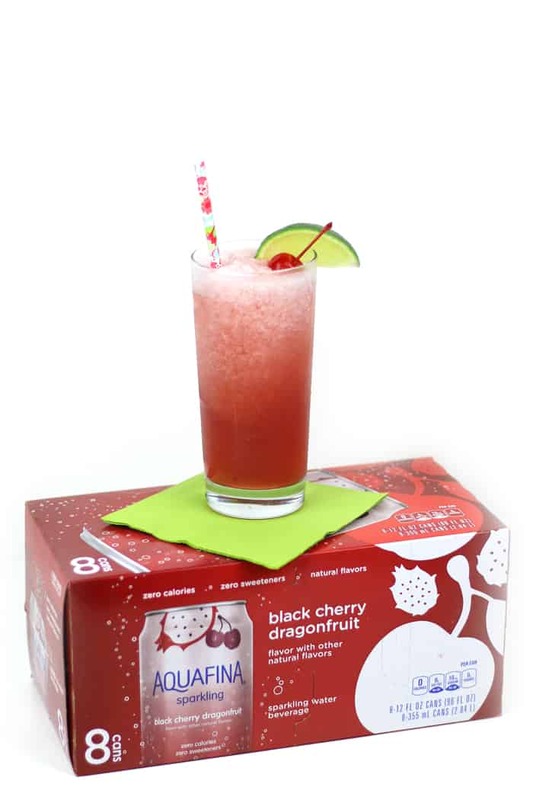 Add cherry limeade mixture, rum, Aquafina Sparkling Cherry Dragonfruit and ice to a blender. Blend until ice has broken down into a smooth pouring consistency. Fill two highball glasses with the slushie mixture. Garnish with a cherry and a lime wedge. Serve immediately. Wow, I really need that drink!!! It looks perfect for our hot summer. Thanks for sharing! These look amazing Susannah! Yay for house work, especially when it involves a refreshing drink like this afterwards!